« Nothing to see yet ! 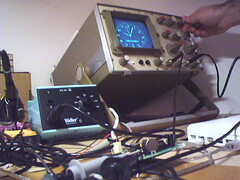 This entry was posted on August 5, 2007 at 2:16 pm	and is filed under Oscilloscope clock, Projects. You can follow any responses to this entry through the RSS 2.0 feed. You can leave a response, or trackback from your own site. There isn’t much to read on my blog regarding the Atmel microcontroller. There are many other resources found easily on Google. The Wikipedia page is a good read, and has a number of good references at the bottom.